In these two years of App Store we've read many stories of indie developers making tons of bucks out of apps sales. Still, I've noticed a trend recently, and that's why the news of Camera+ generating over $250.000 in revenue matters: if you look at the App Store Top Paid charts, you'll see lots of games in there. So the question is: is still possible to be successful in the App Store even without developing a game? Apparently, it is. The Tap Tap Tap developers aren't new to huge numbers: they launched Voices for iPhone last year and it turned out to be one of the most popular apps in the App Store for months. I swear I've seen it in the charts recently, too. But more importantly, John Casasanta is the head of MacHeist, the well-known yearly promotion of Mac software which generates millions in revenue every single time. So this time, instead on relying on MacHeist's mailing list (which counts more than 600.000 subscribers) they decided to do everything on their own and promote the app using Tap Tap Tap's system, which has 70.000 members. This is the only "advertising" they've done. "The total number sold for the first month was over 217k. Our total revenue after Apple’s cut was just over $253k. Our strongest revenue day occurred about a week after launch with us taking in $15,488 that day and we averaged around $8,440 daily for the first 30 days. The only real expenses we had since launching Camera+ were for the launch promo prize (around $10k) plus a few hundred dollars for our “photo of the week” contest prizes. 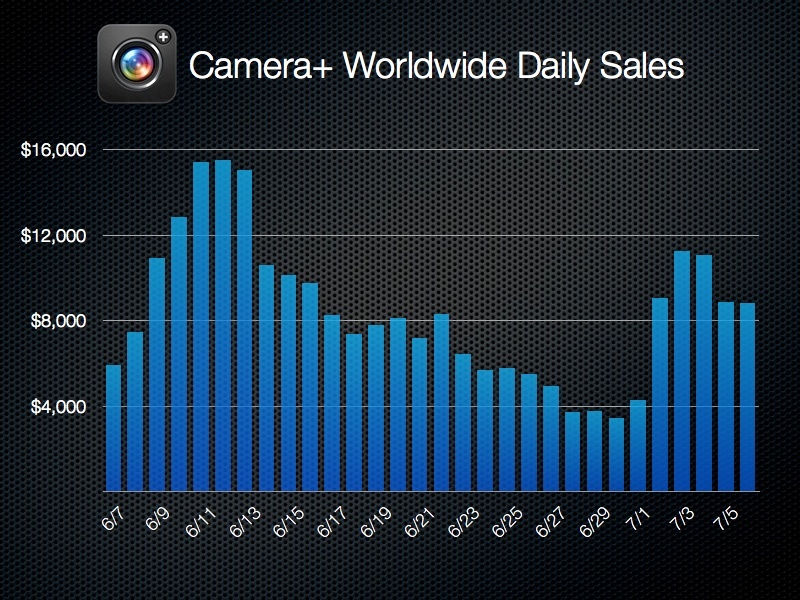 Camera+ did very well in the US early on, reaching as high as #7 in the Top Paid chart and #5 in Top Grossing. But it actually fell off the Top 100 Paid chart faster than our past apps. Whereas Convert and Voices both stayed up for around two whole months each, Camera+ got knocked out in just three weeks. 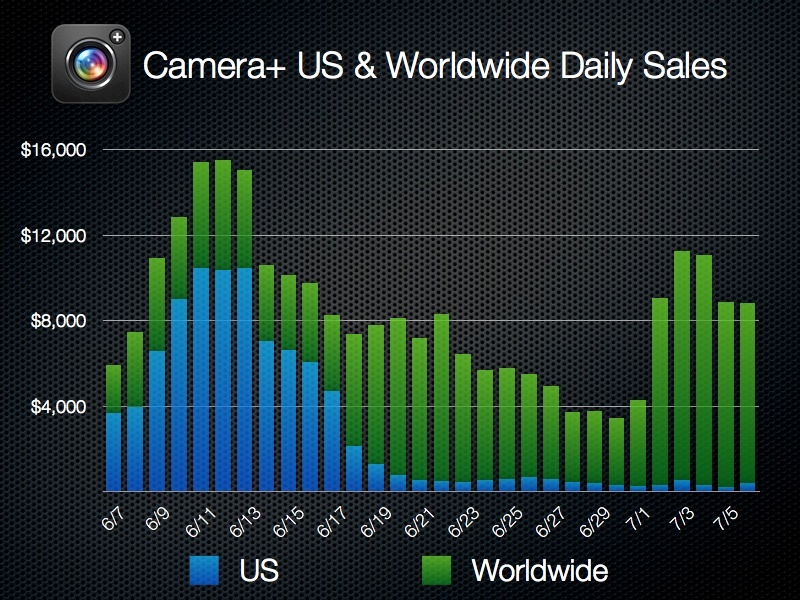 So, back to the 60-70% US figure… for Camera+, the breakdown was actually 37% for US sales. This is obviously a huge difference. We’ve had days where international sales completely obliterated US ones… as in around under 2.5% US." This is impressive, and well deserved. I downloaded Camera+ last week when it added iPhone 4 support and I have to say it's one of the best 3rd party photography apps I've ever tried. Hands down. Its mix of well-thought design, simple yet effective workflow and gorgeous effects and filters make it stand out from the crowd of poorly designed, feature-creep applications currently available in the App Store. We'll review Camera+ for iPhone later this week. In the meantime, congratulations Tap Tap Tap.